KAMPALA – One person has been critically injured when a passenger taxi registration number UAL 830U overturned in an attempt to save a boda-boda cyclist. The accident took place at around 8 am on the road joining Lubiri from St. Lawrence University. The scene of the accident is a black spot as a number of accidents have occurred here in recent weeks. “We believe the cause of the accident are these many potholes. 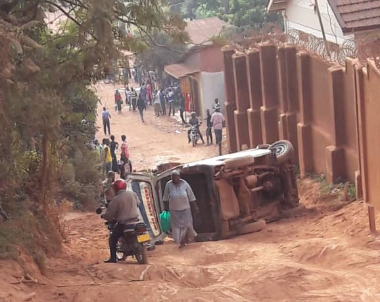 The road is pathetic,” an eye witness who preferred anonymity said, before calling on both the Buganda government and St. Lawrence to work on the road.